Nematodes (roundworms) are one of the most species rich phylum in the animal kingdom. The Sommer lab has established Pristionchus pacificus in the family Diplogastridae as a satellite model organism to the already well-studied nematode organism Caenorhabditis elegans for comparative studies in developmental biology, ecology, and population genetics. Like C. elegans, P. pacificus is a self-fertilizing hermaphrodite with a small percentage of male offspring, which can mate with hermaphrodites and thus allow genetic experimentation and facilitate recombination between different lineages. Extensive world-wide sampling revealed that Pristionchus worms are soil nematodes, which are reliably found in an association with scarab beetles, providing a framework for the integration of lab-based studies with field work. Rather than being symbiotic or parasitic, Pristionchus nematodes have a necromenic association with these beetles. 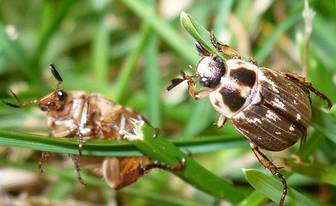 This means that they sit in a growth-arrested stage (dauer larvae) on the beetle and only resume development to become adult after the death of the beetle while feeding on microorganisms that grow on the beetle's carcass (for more information see Sommer, R. J. and McGaughran, A. (2013): The nematode Pristionchus pacificus as a model system for integrative studies in evolutionary biology. Mol. Ecol., 22, 2380-2393). In the lab, we keep P. pacificus on agar plates with the bacterium Escherichia coli as food source. Alternatively, P. pacificus strains can be frozen in liquid nitrogen and can be stored for several years. 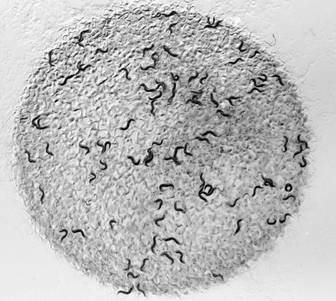 Just like C. elegans, its small size and short generation time, makes P. pacificus an ideal model organism for studying the genetics of developmental processes. More recently our focus has shifted towards a phenomenon that is known as phenotypic plasticity. Phenotypic plasticity is the ability of an organism to change its phenotype in response to changing environments. While P. pacificus normally develops through four larval stages into adult worms, bad environmental conditions (starvation, crowding) can trigger a decision to enter an alternative third larval stage (dauer). The dauer stage can be regarded as a growth-arrested and non-feeding stage that serves to bridge a periods of harsh environmental conditions until more favorable conditions are met. While P. pacificus worms that undergo direct development to adulthood typically live a couple of weeks, our experiments have shown that as dauer larvae they can survive for up to a year. also includes mouth breadth and the number of left subventral denticles. 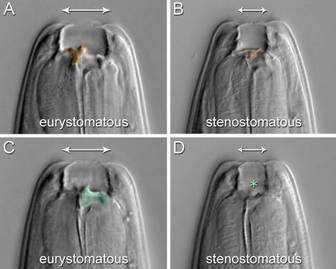 A second example of phenotypic plasticity consists in the mouth form dimorphism found in Pristionchus nematodes. Unlike C. elegans, which is an obligate bacterial feeder, P. pacificus can exploit additional food sources including fungi and larvae of other nematodes (predatory feeding). It has long been known that Pristionchus nematodes can develop two distinct mouth forms that differ in size, shape and the number of tooth-like structures, so called denticles (picture 4 mouth forms). Our recent research showed that the mouth form is strongly correlated with the feeding mode (bacterial vs. predatory feeding). Similar to the decision whether or not to enter the dauer stage, environmental conditions can influence the ratio of the two mouth forms in P. pacificus populations. Sommer lab’s current research is focusing on the role of pheromones in influencing these developmental decisions and is trying to identify the genes that control these processes. Finally, elucidating, how such ecologically relevant traits evolve and change at a micro- and macroevolutionary level, is one of the major goals of integrative evolutionary biology.